Rising Sea Levels Threaten Egypt's Ancient Cities In Egypt, where antiquities have stood for millennia, climate change is posing new threats to an ancient country and its people. 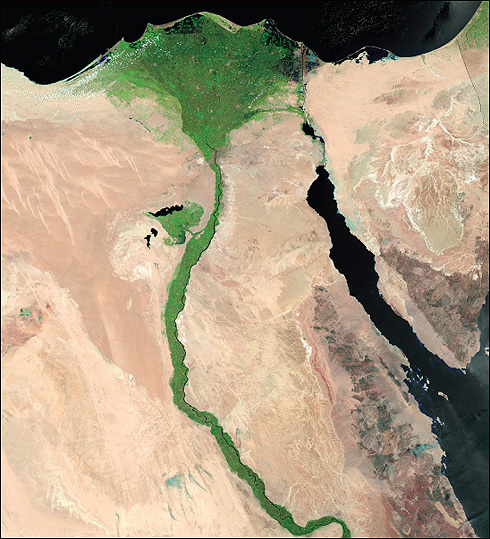 Climate change is causing the Mediterranean Sea's waters to rise, which is affecting vegetation and farming along the fertile Nile River Delta. Rising water levels in the Mediterranean Sea are causing the barriers that line Alexandria, Egypt's Eastern Harbor, to slowly break down. 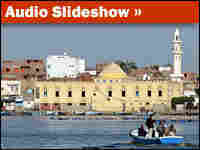 All of Egypt's large cities lie along the Nile, which supports fertile land amid the desert landscape. In Egypt's ancient city of Alexandria, waves from the Mediterranean Sea send foam crashing over the sea wall and onto hundreds of concrete barriers built to protect the city from the rising waters. 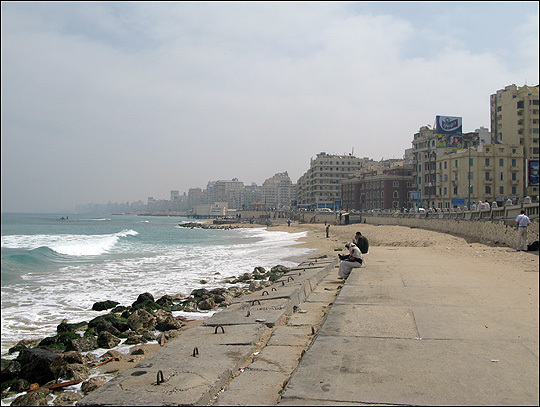 The crumbling barriers of Alexandria's Eastern Harbor, however, are no match for a sea that scientists say will rise between one and three feet by the end of this century. They predict that rural towns and urban areas along Egypt's northern coast will be flooded, turning millions of people into environmental refugees and threatening some of the country's ancient landmarks. Fishing boats and pleasure crafts dot the water off the Eastern Harbor, hiding the jetties, buildings and sculptures from past civilizations that lie just beneath the surface. More than 2,000 years ago, the Macedonian conqueror Alexander the Great established Alexandria as his capital. The city played host to a cast of historical heavyweights: the Ptolemies, Julius Caesar, Cleopatra and Marc Antony. Many of the places they walked are now under water — the result of earthquakes and the natural settling of the land. In 1994, a team of underwater archeologists discovered what they believe to be the remains of the Pharos Lighthouse, one of the Seven Wonders of the ancient world. The tower, which was more than 350 feet high, guided ships into Alexandria's Harbor with a beacon of fire. Emad Khalil, an underwater archeologist at the University of Southhampton in the United Kingdom, says the antiquities that are still above ground may one day suffer the lighthouse's fate. "One of the ... issues we are facing is not just the sea level rising, but the violence in the sea and the waves affecting the corniche, the wall surrounding the Eastern Harbor," Khalil says. Alexandria's residents might not notice the change, but rural farmers say they're already living with the consequences as salty water from the rising Mediterranean pushes into the fertile Nile Delta and contaminates the groundwater used to irrigate crops. Just a few miles from the city's port, Khamiesa Abdelsalam Tuto says the sand that covers the trunks of her family's date palms and tomato plants is quickly being replaced by salt. Her father, Seid Abdelsalam Tuto, is 78 and began farming when he was 8 years old. He began noticing the salt in the 1930s, but he says it's getting worse. To counter the salt's corrosive effects, more sand must be trucked in and laid on top, leaving his family with hard choices, he says. "It's very expensive, and we have to either harvest or eat. And we have to eat," says Khamiesa. "We are barely breaking even right now — everything is on credit, so we grow our vegetables. Sometimes it's a bad harvest, sometimes it's good, but we can barely make it." Just up the road from the farm is the small town of Rosetta, site of the inscribed ancient stone that helped experts decipher hieroglyphics and tell the story of early Egyptian civilizations. 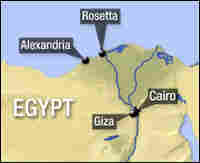 In Rosetta, the Mediterranean meets the western branch of the Nile River. The western branch is the color of root beer — dirty with bits of trash that bob on the surface and collect on banks. Toward the Mediterranean, abandoned buildings line the shore. New construction is scarce because builders fear the land could soon be underwater. Salah Soliman, a professor at the Department of Pesticide Chemistry and Toxicology at Alexandria University, says the Nile used to add soil to Egypt every year. 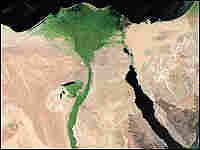 But the Aswan High Dam, built in 1970, has prevented the river from depositing sediments, Soliman says. 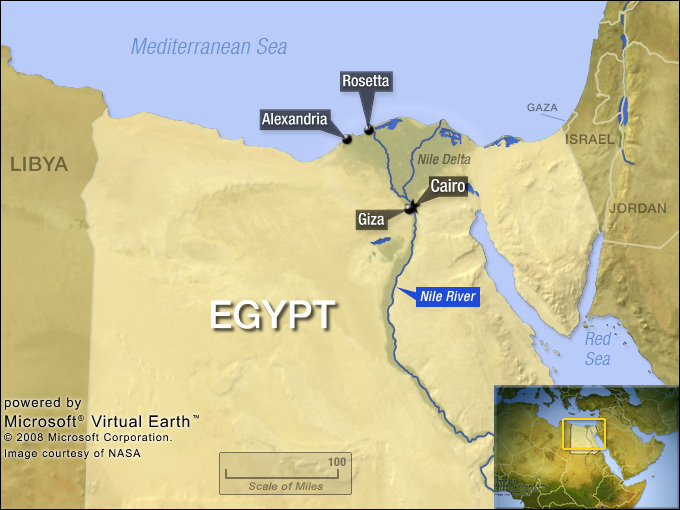 Erosion, combined with the rising sea level, sends saltwater under the rich, fertile soil south of the Nile Delta. When the water evaporates, the salt remains, making it almost impossible to grow crops. "Now with climate change, we are losing what we have gained over the last many thousand years," Soliman says. "Water is coming from the sea toward the southern part of the delta and affecting vegetation and farmers." The Egyptian government is preparing a strategy to adapt to the threat. It is considering proposals such as relocating the population, introducing genetically modified crops and building barriers to protect the lowlands. Egypt's Minister of State for Environmental Affairs, Maged George, predicts that by the year 2020, the effects of global warming will threaten about 15 percent of the land in the Nile Delta. But getting Egyptians to focus on that problem is hard, says Elsayed Sabry Mansour, the minister's adviser on climate change. "Public awareness is difficult because the problem of climate change is that the impacts are not instantaneous — they come later on," Mansour says. "Sometimes we are accused that we are pessimistic, but I prefer to be pessimistic." Soliman's 20-year-old son, Kareem, says he's worried that other countries aren't doing their part to curb climate change by reducing their greenhouse gas emissions. Though Egypt ratified the Kyoto Protocol in 1999, much larger emitters — including the United States — didn't follow suit. The younger Soliman says it's unfair that Egypt, which contributes only 0.5 percent of global greenhouse emissions, will be disproportionately affected by climate change. "I was tricked at first because when I see the traffic jams in Egypt and see the black clouds, I think that we have contributed a lot. But ... we have too little contribution," Kareem Soliman says. 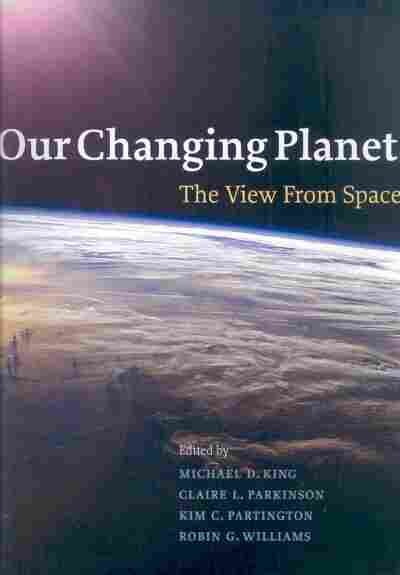 "At the same time, we are facing the big problems and challenges in the future." On the International Coastal Highway, time is already running out. The highway runs from Port Sayyed in the eastern part of the Nile Delta through Alexandria, and then continues west to Libya, Tunisia, Algeria and Morocco in northern Africa. A major commercial artery, the highway has an endless stream of huge trucks carrying goods back and forth through several countries. Originally, the highway was built at about sea level, but Salah Soliman of Alexandria University says most of the areas along the delta will be covered with water in 10 years or less. Much of the land surrounding the highway was once planted with wheat, but signs of the crop are scarce because salt and salt-resistant weeds have slowly inundated the soil. Although scientists are looking for ways to protect the wheat, Soliman says, progress can't come soon enough. "There is a crisis of bread in this country. ... And we have to be prepared for the worst to come," Soliman says. Radio stories produced by Davar Ardalan and Ned Wharton with Sara Abou Bakr.